It's crazy that today marks 14 years since 9/11. That day is easily the most horrific day that I have been alive for. Those lyrics "Where Were You When The World Stopped Turning That September Day?" always give me the chills. 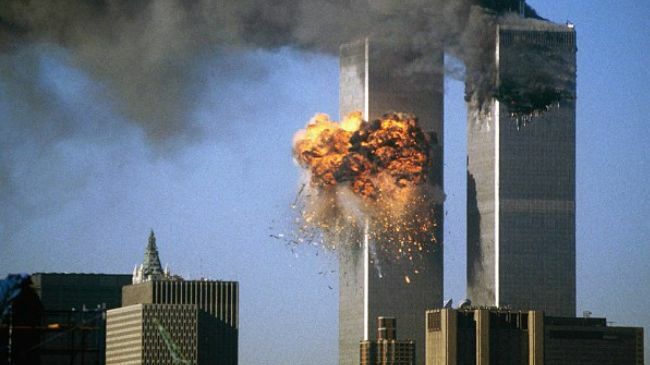 For many, 9/11/01 was the worst day of their lives. They lost husbands, wives, sons, daughters, and the list goes on and on. I cannot even imagine. I still remember that day vividly. I was in Mrs. Miller's 7th grade reading class. I was a 7th grader, so I was old enough to realize what was going on but too young to really understand the ramifications. Mrs. Miller turned the television on, and we all watched in silence as the second plane crashed into the twin towers. A girl named Lauren made a joke and said "Oh my gosh, my uncle lives in New York!". A couple of seconds later, she added "Oh my gosh, so does my aunt!". Everyone giggled softly, me included. I now realize how annoying it is that she was making light of the situation, but she was in 7th grade. Again, we didn't really understand. The look on Mrs. Miller's face told me it was serious. I remember seeing her at her desk, mouth dropped open and eyes glued to the television. When I got home from school that day, my dad was there. They had all been released from work early. I think we stayed at school the rest of the day, but I honestly don't remember that part. I just remember sitting in Mrs. Miller's class watching history unfold on that screen. There are no words to describe what America went through that day, so I'm not even going to try. All gave some, and some gave all. Today I am thankful for the first responders. There has been a lot of negative publicity about police officers lately, and I'm not here to start a debate, but the cops, firefighters, and military that responded that day and every day since did so selflessly. So that's where I was: Mrs. Miller's 7th grade reading class. Where were you 14 years ago today? I was getting geared up for my sixteenth birthday (in ten days), and was sitting in Ms. Born's World History Class. Even high schoolers made light of the situation, and I didn't understand just how important it was until a day or two later. Now it gives me chills to think how our safe world came crashing down. I was a sophomore in college and in my dorm room getting ready to head to my first class. I ended up going to my first class that day but then the rest of them were canceled. I was in 4th grade science class and a faculty member ran in and explained what happened and we all got released from school for a couple days. My mom cried on the way home but I was too young to understand but they explained it to me and my siblings. My dad soon after flew up there to help out with the American Red Cross. He, til this day, states the smell, sounds, and what he saw , he will never forget. The day America stood together. I cannot believe it has been 14 years. I was getting ready for school, I was a sophomore in HS and it was a crazy morning. I was in 4th grade and didn't know anything about it--other than we weren't allowed to play on the playground at lunch-- until I got home from school. I remember watching the news footage and being upset that all of the tv shows were canceled except the news. I was walking to my 11th grade computer class and remember over hearing two teachers discussing what happened. I didnt really know what happened until I went to my next computer class of the day. right before lunch and the whole period of class we watched it on tv. We sat there in awe and shocked about what events had unfolded and what was going on. It was a day that I remember just like yesterday. I was in 7th grade English class too. It was the second week of my senior year of high school so I was in school too. Our district wouldn't let us watch the coverage which I still think it total BS. I didn't even know what terrorists were before then. I was a very naive 17 year old.